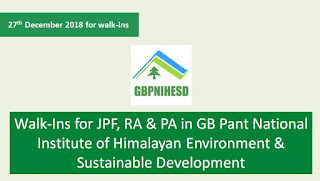 Job applications are invited for the posts of Junior Project Fellow, Research Associate and Project Associate by the GB Pant National Institute of Himalayan Environment & Sustainable Development. 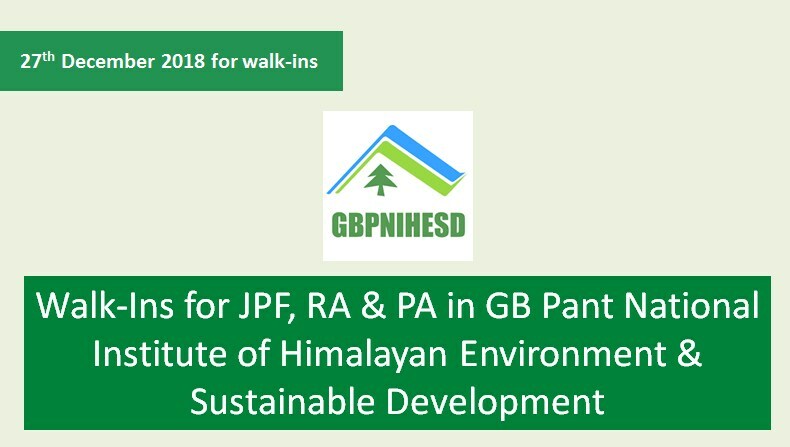 The walk-ins are held on 27th December, 2018 at 10:30 at the institute campus in Pangthang, Sikkim. Candidates are requested to bring along the requisite documents (originals and photocopies). However, they can send a resume prior to the walk-ins to the Scientist In-Charge of this institute in East Sikkim 737101 via email-dr.rajeshjoshi@gmail.com. · First Class Master degree in Forestry/Botany/Ecology/Life Sciences/ Remote Sensing & GIS/ Environmental Sciences, etc. · Preferably, candidates should have field work experience in Himalaya region and database management. · Ph.D. in Forestry/Botany/Life Sciences/ Remote Sensing & GIS/ Environmental Sciences, etc. · Preference will be given to candidates having field work experience in Himalaya region.